Join Bosco and Alex the third Sunday of each month at 2PM as they discuss Post Apocalyptic Fiction.This limited run book club will cover all your favorites, eco-disasters, nuclear holocaust, zombie apocalypse and vampire plagues among other grand end of the world scenarios. Which book will reign supreme? Join them each month and help them decide. This month's book is Earth abides by George Stewart. George R. Stewart's book Names on the Land: A Historical Account of Place-Naming in the United States was available from LibraryThing Early Reviewers. 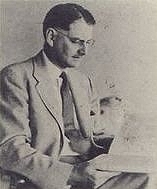 George R. Stewart is currently considered a "single author." If one or more works are by a distinct, homonymous authors, go ahead and split the author. George R. Stewart is composed of 12 names. You can examine and separate out names.